Father Jerry has served St. George since September 2007, and also serves (on a part-time basis) the Missions of Salem and Roseburg. In November of 2002, Father was ordained to the Holy Priesthood and entered into full-time ministry work. Prior to coming to St. George, Father served as the Associate Priest at Holy Trinity Cathedral in Portland, Oregon. 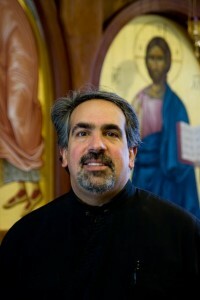 In addition to serving at St. George, Father Jerry served, on a part-time basis, the Greek Orthodox Mission in Salem for three years, and he currently serves the Greek Orthodox Mission of Roseburg. He has led many youth and adult retreats, summer camps, and has devoted himself to hospital ministry, prison ministry, visiting shut-ins, supporting his brother priests, the study of church growth, strategic planning, and renewal. While in Portland Father was instrumental in the founding of Agia Sophia Academy, an Orthodox Christian School. Deacon Kevin Haan is a graduate of St. Vladimir’s Seminary in New York and studied middle school and high school education at Lewis & Clark College. He and his wife, Corey, have three children. During the week, Deacon Kevin teaches social studies at Bandon High School in Bandon, Oregon. Deacon Kevin also serves at his home church of St Nicholas in Portland.